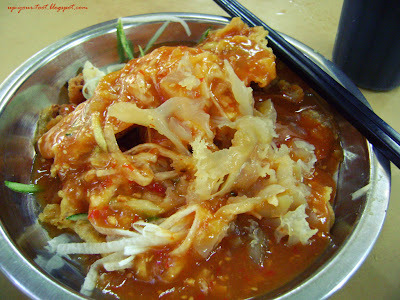 One of the hawker food available in Penang is Cheh Hoo/Cheh Hu. This is actually a Chinese version of the Pasembur/Pasembor Mamak. My family and I went to the Batu Lanchang Market Food Court for lunch and I ordered the Cheh Hu from the stall that had been featured before in a local TV food show called Ho Chak! This Batu Lanchang Market's Food Court Cheh Hu (峇都蘭樟鮮魚/峇都兰樟鲜鱼) stall was doing brisk business when we arrived, and if you are afraid that they might not be able to locate you after taking your order, then it is best to tell them you will self-serve (this usually leads to a shorter wait as they don't have to spend time looking for you amidst the crowd and also they will prioritise your order as to clear you off from the front of the stall). Over here, the price for a small plate is RM3 without jellyfish and RM 4 if you want it with jellyfish. Chinese Pasembor/Pasembur a.k.a. Cheh Hu/Cheh Hoo (鮮魚/鲜鱼). This is a popular stall that was featured in a local Malaysian food review show called Ho Chak! The yellowish, frilly looking stuff at the lower right hand corner of the plate is jellyfish that was added to the dish. The name Cheh Hu/Cheh Hoo (鮮魚/鲜鱼) is a misnomer of sorts. The name literally translated implies that it is raw or fresh fish. However, there is no fish meat (raw or otherwise) in the dish, and the only thing that comes close to that is the addition of jellyfish that has been poached. The dish usually contains shredded cucumber, jicama (sengkuang), fried bean curd (tau kua), crispy fritters, poached jellyfish and served with a sweet potato gravy and crushed peanuts. You can request for the gravy to be hotter, through the addition of chilli sauce. If you rather not eat jellyfish, then you can opt for one that has no jellyfish included. The dish is good as a snack or an appetiser, however ordering a large helping might prove to be very filling. The texture provided by the various ingredients, together with the contrasting flavours of the fresh jicama and cucumbers with the crunchy fritters and jellyfish, melded together by the sweet and slightly hot sauce will tantalise your taste-buds. Batu Lanchang Wet Market is located on Lebuhraya Batu Lanchang off Jalan Masjid Negeri (Greenlane). If you are coming from town, go down Jalan Masjid Negeri until you pass Lam Wah Ee Hospital, then the old folks home (Rumah Orang Tua Uzur. A Petronas petrol station comes up next in which you turn left at the next major junction into Lebuhraya Batu Lanchang. Go down the road and head for the market. Turn left into the market at the junction after the bus stop and park at the parking lot. The food court is located on the left of the market (if you are standing facing the market). There is a small Tua Pek Kong (大伯公 also known as 福 德 正 神) temple at the side of the food court so you should be able to spot it easily. First time I heard about this dish. I certainly like to try this. I have been eating out frequently these days after school at China town this month. I was wondering if you can recommend me a good place to eat there with affordable price for student;-). Sorry for the late reply, back to hometown for CNY, my godmothers family came by and my dad had an operation. There is not much choice at Chinatown, other than the standard noodles or rice fare between the two food halls there, isn't it? Though the prices are not too bad (still steep if thinking in RM, lol). Next time I go to Penang, I hope I have the opportunity to try this dish. Do try it when you go to Penang. The sauce and the fritters are the secret ingredient. Never thought of that, but you are right, we should. Though it might set of another 'internet storm' with our neighbours if they do that. Hope your dad recovering well from his surgery. So tired end of the day, so in search for nasi...and chinatown area parking is free in the evening. I didn't know parking is free in the evening. Yup, eating out beats cooking, especially after a long day. My dad is doing OK, thanks.